It has taken me a while to get round to the second post based on a morning at Glencairn primary working on the ipod touch project. In fact the pupils have beat me to it: Comic Twist. After syncing the ipods I did a wee bit of work with the class on their new apps. The first app was Comic Twist which allows you to create comics with up to 3 panes a little like Comic Touch, the Comic Life for the ipod/phone. I went for comic touch as it is cheaper that Comic Touch and does 3 panes in a comic. The second app is i think going to be a great one, it has been sitting in front of my nose for quite while, firstClass. FirstClass is the email and communication systems used in North Lanarkshire Education and I have been rather slow to realise its potential for all sort of things. It is a great way to have discussions, share files etc. I’ve used the mobile client on my iPhone a lot mostly for email, it is amazingly quick even in an area with a very poor mobile connection. I just had not thought of using it with pupils. 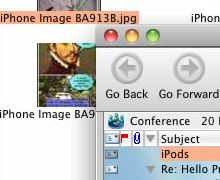 The weekend before the iPod touch conference it suddenly dawned on me that we could use it to pass files around the classroom, messaging etc. At the conference the children from the Friezland iPod Project were using firstClass in this way. So when I got to return to Glencairn I synced the iPods with new software and showed the pupils their new firstClass account. 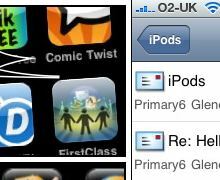 We are only using one account for all the ipods to share but the children could easily upload images (created with comic touch) and join in a discussion. The images and discussions can of course be accessed on a desktop or via the web. This makes it very easy to get text images and files onto and off the iPods. We could add movies to a file store in firstClass on the desktop and access it on the touches. We even quickly tested exporting a keynote presentation that some pupils were working on and uploading it, it worked a treat. Click on the thumbnails to see bigger versions of desktop and iPod views. 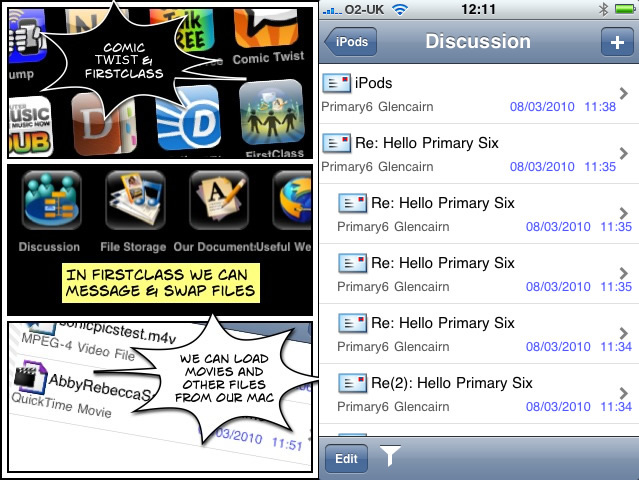 I think FirstClass is going to be very useful for working with iPod touches in the classroom.